When we first learn to draw, so much of our effort is spent on getting it right—placing the lines, rendering the values, representing the objects just so. These are important first steps, because we are learning to really see the world. But if we want anyone to look at our drawings for more than ten seconds, then we need to do more than represent the physicality of a thing. We need to convey its life and energy. This is where Egon Schiele can teach us all a few things. Schiele was an early exponent of Expressionism, and although he was dead by the age of 28, his artwork would survive him to this day. One hundred years after his death, we are still fascinated by the energy and emotion Schiele conveyed in his work. 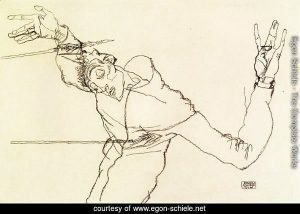 There are three techniques in particular that we can learn from Schiele’s drawings to help us improve the life in our own work. Schiele worked primarily in self-portraits, the human figure, and landscapes. I’ve taken examples from each to help us understand the importance of going beyond mere representation. Like a jazz musician playing variations on a theme, it’s important to bring variety to the elements within a drawing, particularly line. So, how can we vary line? Consider these two qualities: weight and continuity. By weight, I am referring to the thickness and boldness of the line. Is it wide or thin, dark or light? By continuity I am referring to a line being solid vs broken, as well as line that modulates its weight for effect. 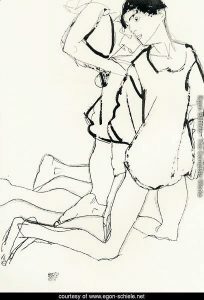 Let’s take a look at Schiele’s Two Kneeling Figures (1913) to see how he uses line. We see thick, bold lines describing the contours of the garments worn by the figures and, interestingly, to describe the negative shape between the arm and body of the farthest figure. These heavy lines have the effect of blocking in or framing the young man’s gaze. By contrast, the figures themselves are constructed using thin lines, some bolder than others. We can almost feel the weight of the garments hanging on these fragile, young people. Liegendes Madchen (above) is a great example of Schiele’s use of lost line. Line is broken and soft at her weight-bearing right shoulder that pushes into the surface she lies on. And the lines completely disappear at the outer extremities, placing focus and emphasis on her face and torso. In our own drawings, it’s important to vary line weight and continuity. For example, thicker, darker lines can denote areas in shadow or surfaces contacting other surfaces. Thinner, lighter lines can recede a form into the background or curve it into the light. Highlights on a surface can be denoted by lost or broken line. In order to describe the world around us we sometimes need to use straight lines. But unless you have a good reason to convey perfection, it’s best to leave the straight edge in its drawer. A nearly-straight line will almost always be more interesting. Old Houses in Krumau (1914), one of Schiele’s landscapes, necessarily uses straight lines to describe the structures of the drawing. It’s evident, however, that these lines are not perfectly drawn. He didn’t use a straight edge. His lines are parallel and squared where they need to be, but there is a subtle looseness about them that keeps the drawing lively. If you find it difficult to draw a straight line, the issue might be with how you are holding your drawing instrument. Instead of holding your pencil, for example, in the writing position, try cradling it across your fingers, thumb on top, with the tip pointed away from you. Then place your point and pull downward on the paper. The trick is to counter the natural pivot of your wrist. The energy that straight lines drawn freehand can bring to your work is further described in our last point. 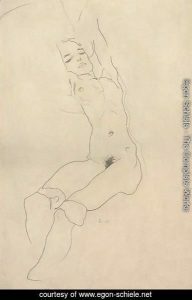 Schiele’s drawings have a quality about them that is best described at free. Take a look at Self-Portrait as St. Sabastian (1914). There is a looseness and fluidity in his work that comes with a familiarity with (and in Schiele’s case mastery over) the medium. The closer you hold your drawing instrument toward the tip, the more control you will have. But you will begin to lose grace. As you move backward, away from the tip, you will start to lose control. But you will gain grace. The trick is to find the balance. If you’re drawing with a pencil, you have to be able to control it, but you don’t want to sacrifice the grace of line that will give your work life. When practicing this style of drawing, find that balance, and then give up just a tad more control. It’s practice after all, and you will get better at learning to control those graceful, fluid lines. Schiele was an expressionist. He brought his own style and interpretation to the table. We can’t all draw like him, nor do we want to. But if we can bring that sense of freedom to our own work in our own way, our drawings will certainly improve. The goal shouldn’t be to merely represent a thing. If that’s the case, the best tool for the job is probably a camera. 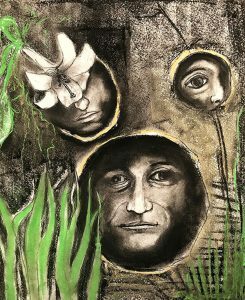 Instead, we should try to convey a sense of what we are seeing and, more importantly, who we are as artists. See future How-To articles and more–register for Flesh On Bone Blog by leaving your name and email above! 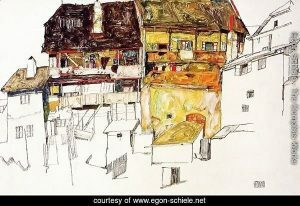 All images courtesy of www.egon-schiele.net.